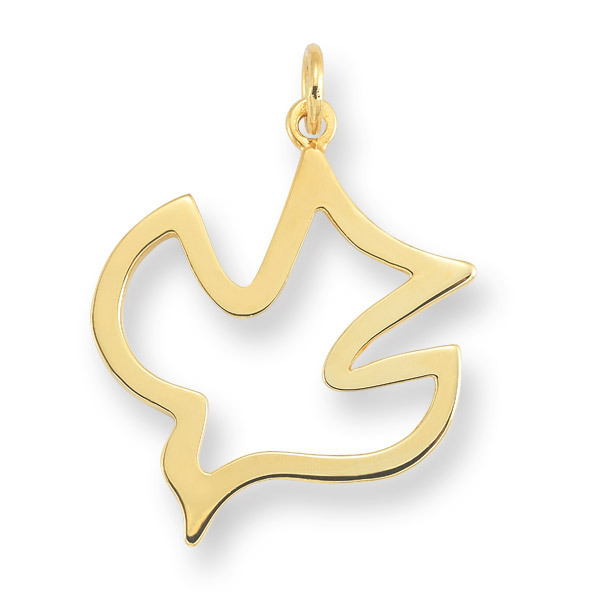 A revered symbol of the Christian faith, the Holy Spirit dove makes for an elegant and thoughtful pendant. This Apples of Gold piece features premium quality 14K yellow gold for traditional beauty that truly shines. The Holy Spirit dove pendant is a simple outline of the dove's silhouette, creating a slightly modern view of this wonderful symbol. The basic dove shape and clean lines of the pendant allow this piece to be worn as everyday jewelry or for a special occasion. Pendant measures 1 3/16" tall x 1" wide not including bale. Including bale the pendant is 36mm long. Pendant thickness is 1.5mm and weighs approximately 3 grams. We guarantee our Christian Dove Holy Spirit Pendant in 14K Yellow Gold to be high quality, authentic jewelry, as described above.